A few years back the Washington post had a contest to find the best brownie recipe. This was the winning recipe in February, 2007 from a lady in her 90’s. She credited this recipe with keeping her husband happy for over 60 years. If you ask me, that’s some serious praise! This recipe is a result of many experiments to create the perfect brownie: thick, moist and chocolaty. These brownies are for purists who like nothing but brownie in their brownie, although chocolate chips or toasted chopped walnuts could be added. 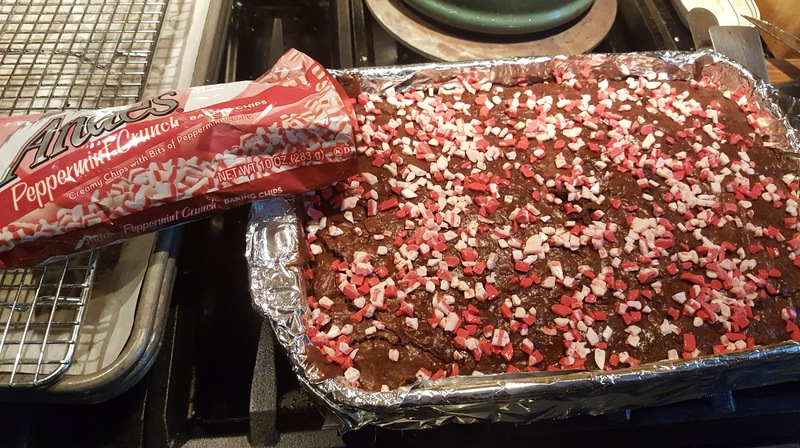 For this holiday version we added 2 cups of Andes mint chips to the batter then sprinkled 1 cup of Andes peppermint chips over the top while the brownies were still hot. Preheat oven to 350F. Line a 9 x 13 inch pan with aluminum foil or parchment paper allowing ends to hang over an inch or so then spray with nonstick cooking oil spray and set aside. DO NOT SKIMP on the foil! You will need this to get the brownies out of the pan. Melt the butter in a medium saucepan over medium heat or microwave in a medium size bowl. Remove from the heat and add the cocoa powder stirring to combine. Let cool slightly. In a large bowl whisk the eggs together, then add the sugars and vanilla extract stirring to combine. Add the cooled butter chocolate mixture to the egg sugar mixture and stir to combine. **We added two cups Ande’s Mint Pieces to the batter at this point for a minty holiday brownie. Fold in the flour and salt until just combined; DO NOT over-mix. Spread the batter evenly in the prepared pan, making sure the corners are filled. If you just plop the batter in the pan, it will cook however you leave it. This dough does not spread when heated. Bake for 40 to 45 minutes or until a crust forms on the surface and a toothpick inserted into the center comes out mostly clean. ** We sprinkled the brownies with Ande’s Peppermint Crunch chips and let them melt onto the top of the brownies before cooling and cutting. Cool completely before cutting the brownies. 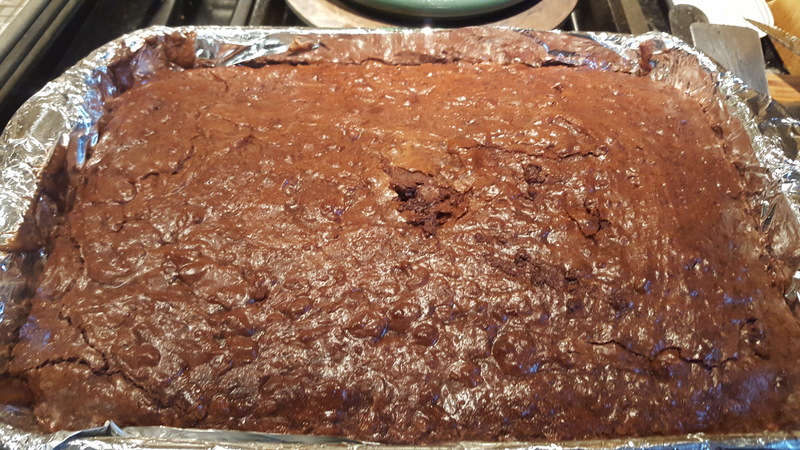 Once cool, cutting the brownies is easier if you remove the brownies from the pan by lifting the overhanging foil. Place brownies on a cutting board and using a large knife cut into desired size and shape. We put the cut brownies into holiday cupcake papers to add to our cookie boxes.